While this article is not intended to give all details about MBD, it touches on the highlights and gives a layman's explanation of how to recognize and prevent the disease. It is not intended as a source of veterinary advice. Metabolic Bone disease is one of the most common ailments and causes of death in captive reptiles. The pity is that it is preventable and sometimes "curable". MBD is usually caused by improper care and improper diet. While all reptiles are at risk, it is most often seen in green iguanas, who are particularly susceptible to long bone growth problems. They are popular and they grow quickly and large. They are also inexpensive and most often the lizard of choice for novices. As a general rule, MBD can be described as a weakening of bone or impairment of some vital functions by an imbalance between calcium, phosphorous, and vitamin D.
Signs of MBD can usually be felt before they can be seen. Bumps along the spine and tail vertebrae, hard knobs in the long bones of the legs etc. A routine physical exam is very important to catch the early signs. Further signs can be a jerky gait, repeated tremors and twitching, spending all of the time on the floor of the cage (in the case of arboreal reptiles). This chameleo calyptratus has obviously been mistreated. You can see that he has been suffering from Metabolic Bone Disease (MBD) for quite some time! The bent jaw, the curved legs and casque all show that whoever had this magnificent pet did not give him proper lighting, supplements or care. Don't let your pet suffer the same way. Calcium is used by the body for several functions: most importantly for muscle contraction (including the heart muscle) and blood clotting, but also for bone growth and integrity. When calcium is missing in the diet or is low, the body tries to compensate by pulling calcium from anywhere it can (ie: bones) to compensate. That leaves bones at constant risk of weakening. They literally disintegrate in the face of constant onslaught from the need for calcium for other functions. 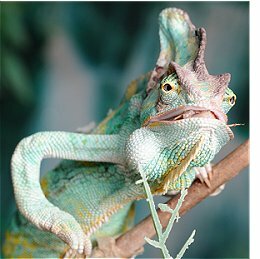 Anything that negatively affects a reptile's appetite will necessarily restrict his intake of proper nutrients: UVA "visible" light and heat come to mind. All reptiles and amphibians benefit from UVA lighting. The "visible" spectrums induce "normal" behaviors, stimulate appetite and breeding. Without this important light source, your rerptile may suffer lethargy, poor eating, and depressed functions - including poor calcium intake and assimilation. Additionally, if your reptile environment is too cool, his digestive processes can be impaired and his calcium utilization will be inhibited. Too little calcium or too much phosphorous in the diet can cause metabolic bone disease. Calcium must be provided in a ratio of approximately 1.5 parts Calcium to 1 part Phosphorous (1.5:1). Most foods in the reptile's diet provide some calcium and phosphorous. How much and in what ratio depends on your reptile's daily intake of different content. For instance, Pinky Mice provide a ratio of approximately 0.89:1 - much too little calcium compared to the phosphorous content. If this wre your reptile's only food, he would need the calcium supplemented. If you add a "balanced" Calcium-Phosphorous supplement containing 1.5Ca:1P to these diets you will never get it balanced. There will always be too much phosphorous and too little calcium. Therefore it is extremely important that you know what you are feeding and how much of one or the other you must add. Vitamin D is a critical factor. The USDA requires that milk manufacturers add Vitamin D3 to milk so that human children (and adults) are provided with a source for this important nutrient right in the same glass that provides the calcium for their diet. Like humans, reptiles must have Vitamin D in order to assimilate calcium. Many calcium supplements include vitamin D.
However, many reptiles do not absorb vitamin D well through the gut. 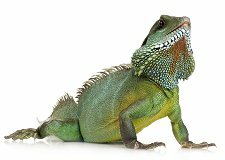 Therefore they require sufficient UVB lighting to manufacturer their own vitamin D. Some research has established that green iguanas respond much better to UVB light for Vitamin D3 systhesis than they do to vitamin D3 injections or food supplements. Terrarium Tops filter out much of the beneficial UVB rays. Aluminum screens filter out roughly 30%. Glass filters out nearly 95%. Make sure the fluorescent lamp has only 1/8" screen or larger between the UVB bulb and your reptile. Also make sure reptiles can get within 12" of the UVB bulb. Optimum UVB output is 5% total energy. These are optimum for the reptiles and not dangerous to humans. Remember, you should replace your UVB fluorescent lighting every few months to maintain optimal levels, as all lights decrease over time even though the change is not visible to the naked eye. Other factors such as the presence of oxalates in the diet can affect the absorption of calcium. While many fresh foods are touted as great sources of calcium (such as spinach, carrots, collards, chards and other thick leafy greens) they contain calcium oxalates that bind calcium. This renders most or all dietary calcium, both that contained in the foods and that added to the foods as supplements, unavailable for maintenance and growth, depending on the quantities ingested.